The M-1951 cotton field cap is a visor style with a circular top crown and retractable earlaps, and is a lightweight windproof item incorporating a very thin layer of insulation only in the earlaps. It was designed for ground troop wear in a range of cold-wet to hot environments. The M-1951 winter hood is worn attached to the coat for protection against the wind and snow as a component of the cold-wet uniform. 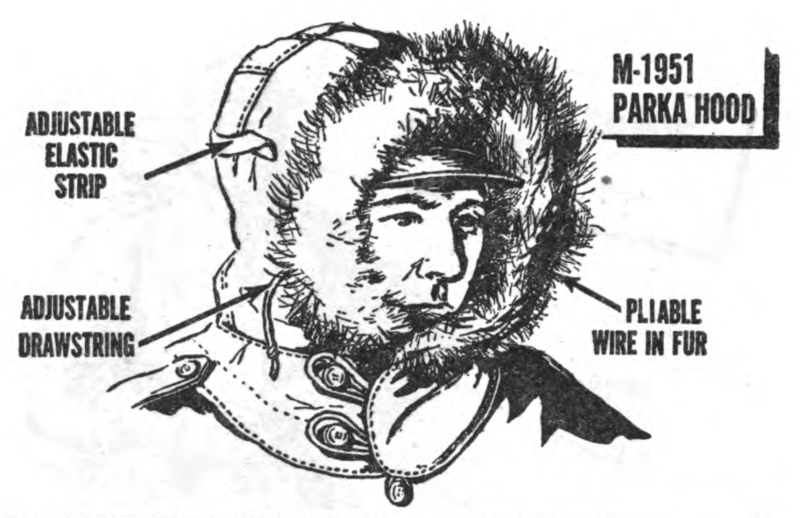 The M-1951 winter hood with fur ruff is worn attached to either the coat or the parka as a component of the cold-dry uniform. 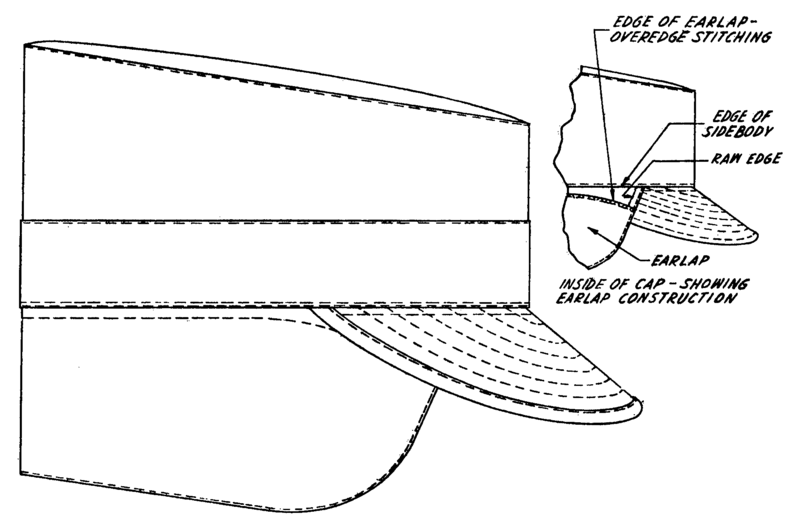 The hood may be worn over the cotton field cap or the pile field cap. The steel helmet is not normally used with the hood. The M-1951 field jacket (later redesignated coat) ensemble is made up of a shell and a detachable mohair frieze liner which is attached inside the shell for extra warmth.The jacket ensemble is worn directly over the intermediate layer in cold weather. The M-1951 parka ensemble is made up of a shell and a detachable mohair frieze liner which is attached inside the shell for maximum insulation.The parka ensemble is worn as an outer garment of the cold-dry uniform with a fur-ruffed hood for added head protection and may be worn over the coat. 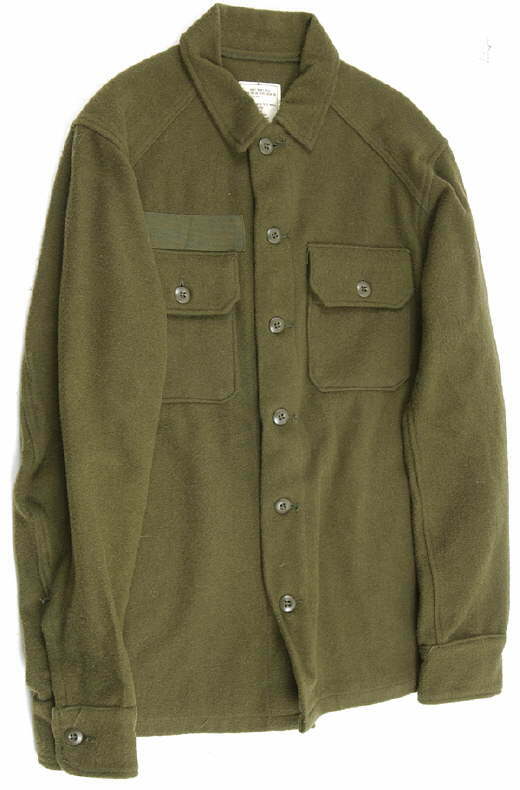 The wool field shirt is intended for wear as a component of the cold-wet and cold-dry uniforms for temperate and cold areas. The M-1951 arctic trouser ensemble is made up of a shell and a detachable mohair frieze liner which is attached inside the shell. 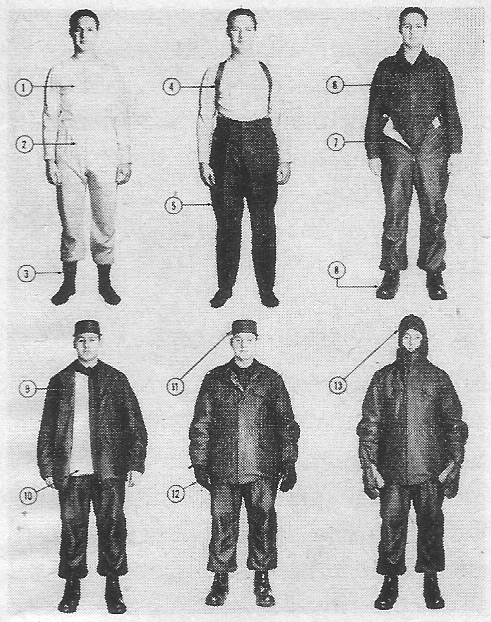 The trousers are worn over the field trousers when the soldier must remain inactive (in a listening post, for example) and when temperatures of -50 to -60°F (-46 to -51°C) are encountered. The M-1951 wool field trousers are intended for wear as a component of the cold-wet uniform ensemble. The M-1951 field trouser ensemble is made up of a shell and a detachable mohair frieze liner which is attached inside the shell for extra warmth. The shell is worn over wool trousers as the outer layer in cold-wet climate or worn with the liner as the intermediate layer in cold-dry climate. Military specification MIL-C-1911 initially covered a cap made from olive drab shade 7 cotton poplin with flannel lined earlap. MIL-C-1913: CAP, FIELD, PILE, O.D. Military specification MIL-C-1913 covers a cotton poplin, field cap with wool pile lined earflaps. Military specification MIL-H-11023 covers a winter hood with fur ruff used with the coat or the parka. Military specifcation MIL-H-11377 covers a hood for M-1951 field jacket. Military specification MIL-L-11449 covers a mohair frieze liner for the M-1951 field coat. Military specification MIL-L-11787 covers a wool liner which is attached inside the arctic shell trousers. Military specification MIL-L-11788 covers a mohair frieze liner for M-1951 field trouser shell. Military specification MIL-P-11012 covers a wool liner which is attached inside a parka shell. Military specification MIL-P-11013 covers the requirements for M-1951 parka shell. Military specification MIL-S-10858 covers the requirements for a wool/nylon, cold weather field shirt. Military specification MIL-T-11786 covers the arctic shell trousers. Military specification MIL-T-1870 covers the requirements for trousers made from wool material. Military specification MIL-T-2060 covers the M-1951 field trouser shell.